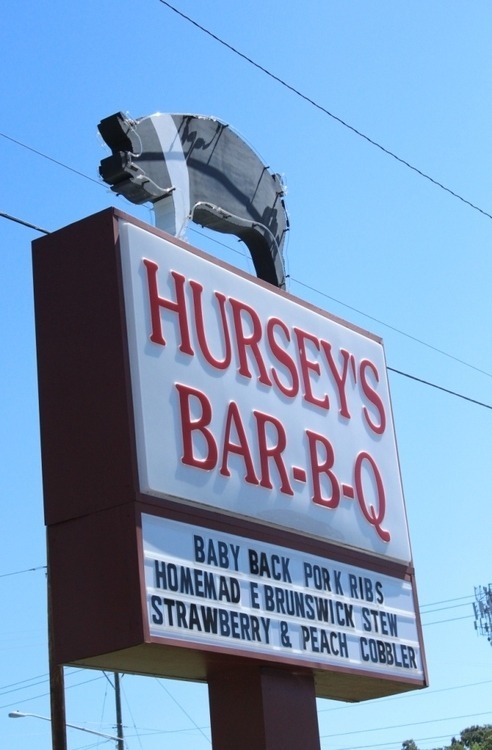 My latest stop on the Historic NC Barbecue Trail was Hursey’s Bar-B-Q in Burlington, NC, a town familiar to anyone who regularly drives between Raleigh/Durham/Chapel Hill and Greensboro or Charlotte. 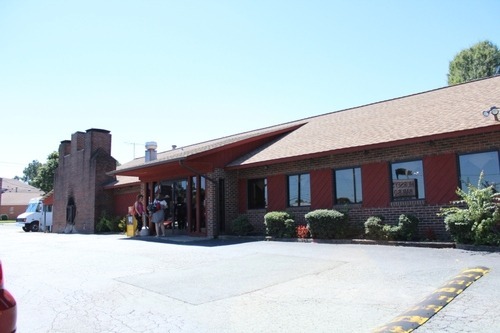 Not to be confused with the fast food version of this restaurant in Graham off I-85/I-40 (housed in what I believe is an old Hardee’s), this joint is off Church Street near downtown Burlington in a brick building where it has resided since 1960. 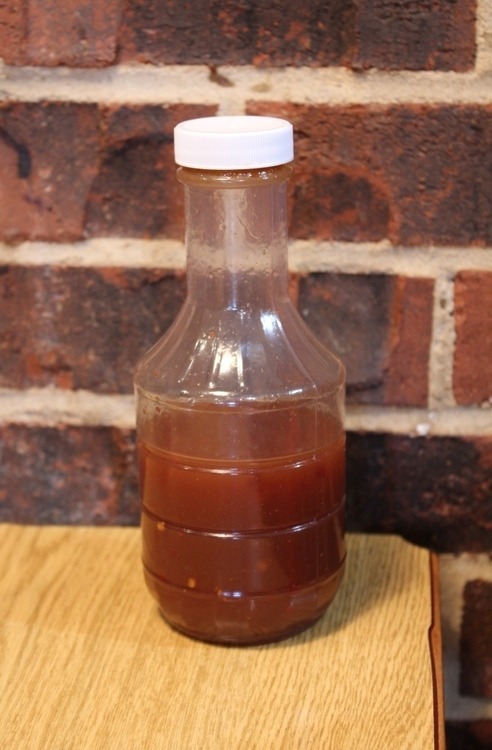 Burlington is located in the piedmont between Greensboro and Raleigh/Durham/Chapel Hill but Hursey’s cooks open pit eastern NC style barbecue with a slight kick to its vinegar sauce. It has a nice chop and moistness to it, but lacked a little smoke. The table side dip was nice, if not essential. I ordered the BBQ & chicken combo since it was the special of the day and lo and behold received a thigh and drum of fried chicken. Which was actually pretty good, just not exactly what I was expecting. 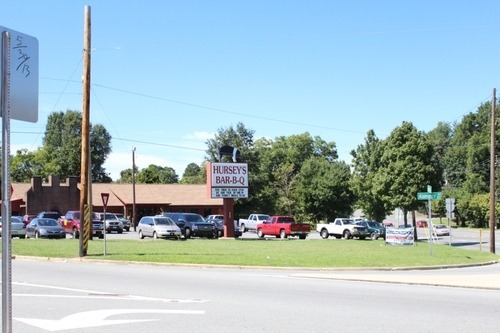 I should have clarified with the waitress before ordering or just gotten only barbecue in the first place. The hush puppies were little orbs cooked to golden brown perfection but what really set it off was that they were served with honey butter (!!). 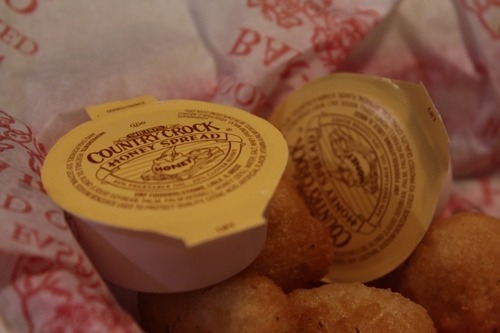 If you have ever had perfect hush puppies with honey butter, then you know what I’m talking about. If you haven’t – well man, you just haven’t lived. 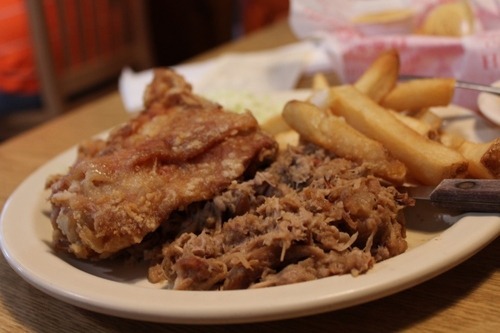 The slaw was mayo based and average – not much to write about it. The fries were fries. In keeping with the eastern NC theme, my wife got the BBQ & brunswick stew combo and found the brunswick stew to be disappointingly bad cooked with what tasted like store-bought vegetables. Which was unfortunate since for the most part we enjoyed our visit there. 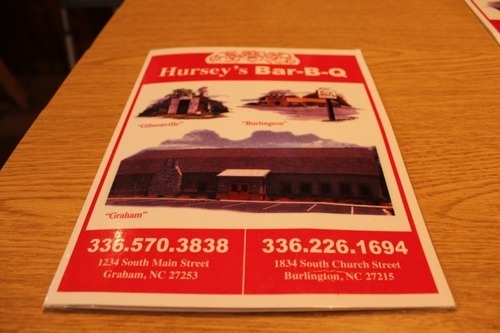 Hursey’s is just a few minutes off the highway and worth checking out if you are heading from the Research Triangle towards Greensboro or Charlotte. 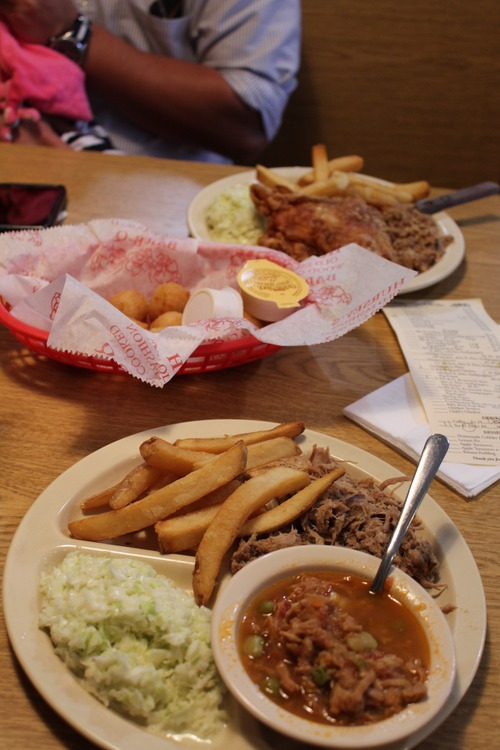 Just don’t mess with the brunswick stew.